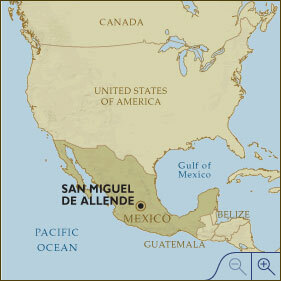 San Miguel de Allende sits at an altitude of 6,435 feet above sea level. Located in Central Mexico it is easily reached from Mexico City, 171 miles away, or the nearby León Airport which is 1 hour and 30 minutes from the city or Queretaro Airport just 1 hour away. 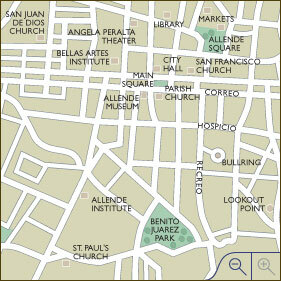 Visitors may fly into either Mexico City, Queretaro Airport or the Guanajuato-Leon Airport. has direct flights from Houston and is served by Continental and Aeromar and is an hour drive away. has direct flights from Dallas, Los Angeles, Houston, San Jose and Oakland (California) Mexico City and is served by American Airlines, Continental, Mexicana, Aeromexico and is a scenic 1 and a half hours drive away. is served by most major airlines including Aeromexico, Mexicana, KLM, US Airways, Air Canada, Delta, Lan Chile, Continental, American, Alitalia, AirFrance, Alaska, Japan Airlines, Taca, Swissair, Lufthansa, United, Varig, Iberia and is a 3 hour drive away. 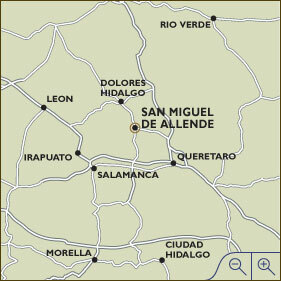 A high-speed toll road to and from Mexico City (Highway 57) is accessible 20 min away from San Miguel. 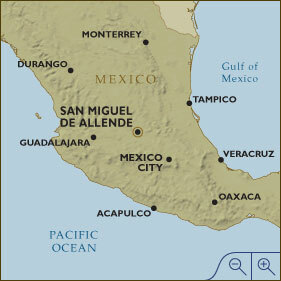 The same highway runs north to San Luis Potosi, Matahuala, Saltillo and from there connects to toll roads to Monterrey and Nuevo Leon.